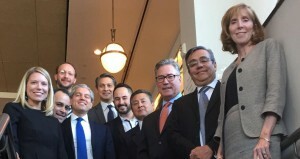 Mexico Deputy Secretary of Energy for Hydrocarbons Aldo Flores-Quiroga met with PESA Executives on October 18 over a private lunch hosted by the PESA Mexico Task Force. The Secretary shared insights into Mexico’s developments, including the transformation of its oil and natural gas industry with 67 E&P companies now having a presence in the country. The Secretary also highlighted the recent successes of two private companies that have announced discoveries totaling 3.4 billion barrels of oil equivalent (BOE). The Secretary expects private sector to build on that success through a robust five-year offering plan that includes more than 500 E&P blocks and 80 production fields. The Secretary provided an overview of the upcoming shallow-water and deepwater acreage that will be offered for tender in January 2018. Twenty-five operators have already signed-up to participate in a bidding round which has prospective resources of more than 6 billion BOE. Also, PEMEX will be offering a farm-out opportunity for the deepwater Nobilis-Maximino block which is reported to have reserves of 500 million BOE. The continued transformation of Mexico’s oil and natural gas industry will bolster opportunities for the oilfield service and supply sector particularly those offering innovative solutions to complex E&P activities. Members interested in joining the PESA Mexico Task Force should contact PESA Senior Director – Public Policy Jean Gould.